Ox&Pen is also a mobile app, but is so much more than merely a digital punch card. Instead, local merchants featured on Ox&Pen are part of a network; the points customers earn at any of these merchants can be cashed in for rewards at any merchant in the network. By making points universal, Ox&Pen makes it easier for members to earn each loyalty reward. Loyalty points are not just earned through purchases; members also accrue points with check-ins, social shares, written reviews and friend referrals. In that sense, it is also a social loyalty network. Over the past few years, daily deal sites became the self-proclaimed presumptive kings in consumer marketing. From New York to New Mexico and Washington State to Washington, D.C., consumers were buying vouchers for 50% off goods and services; they couldn’t get enough. For all the savings they offer, daily deals are still not the perfect package. To use daily deals, customers must make upfront purchases for vouchers they may not even have time or remember to use. Merchants who have used daily deals aren’t necessarily seeing the repeat, full-paying customers they need after the initial surge of traffic. The model is missing an incentive for customers to be loyal, to return to the merchant to make another purchase. There isn’t a dearth of companies out there willing to step up and fill the hole that daily deal sites left open – loyalty. In Chicago, there has been lots of talk about loyalty programs and, more specifically, universal loyalty programs. So what is a universal loyalty program? Many of the companies branding themselves as universal loyalty programs involve a mobile app for your smartphone that allows you to rack up loyalty points at hundreds of vendors around the city. Effectively, these apps are digital punch cards that log points you’ve earned at each establishment. The app knows that you have 12 points here, 15 points there, and five points at that place across town. That’s great that all your loyalty points are in one place, but what if your loyalty points won’t get you anything at any merchant until you have 100 points at each place? And chances are slim that you’ll rack up that many anytime soon, especially at the place across town. And why is a network built around universal loyalty points advantageous? Ox&Pen’s objective is to incentivize shopping and dining at unique, local merchants. By creating a universal rewards network, members have added incentive to spend and engage with local, independent businesses, a benefit to both consumers and merchants. Ox&Pen is the first-of-its kind, smartphone-driven universal loyalty network of unique Chicago merchants and the customers who love them. Members in the network earn points for purchases, check-ins and social shares. Additional points can be earned for inviting friends who become members. The points are good toward rewards at any merchant in the Ox&Pen network. In addition to the loyalty rewards, members have unlimited access to promotional offers that require no upfront purchase or printing of vouchers to redeem. 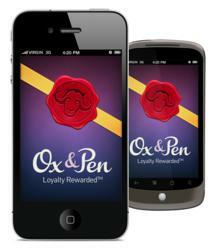 Points and promotions can be redeemed conveniently using the Ox&Pen mobile app for iPhone® or Android™. Membership is currently free. Visit http://www.oxandpen.com to learn more.